Fire sprinkler systems are an invaluable resource in our fire protection arsenal. As building codes continue to evolve, these systems are becoming increasingly common in all types of occupancies and sizes of construction. This increased presence in our communities demands a greater awareness and understanding on the part of all fire service personnel including firefighters, company officers, command officers, and code officials. Each person involved needs to understand how these systems will impact their function and how that affects other fireground operations. A sprinkler system is of little value without an adequate and reliable water supply; yet, one of the least understood components of that water supply is the fire department connection (FDC). Members in all capacities need to be able to ensure that these systems perform at their optimum and are properly used to best minimize the risk of fire to property and life. Let’s get something clear first: That hose fitting on the exterior of the building is not a “siamese”; it is not a sprinkler connection anymore than it is a standpipe connection. That device is the fire department connection. Before we scoff and dismiss this as a technicality, let’s consider for a moment how important being “technically” accurate on the fireground could end up being. Say an order is given to an arriving engine to “hit the siamese.” I’m pretty sure we agree that the intent is not to drive the apparatus into the building. But what happens when the crew stretches its hoselines to the building and is greeted with multiple connections, one labeled “standpipe” and the other labeled “sprinkler”? What happens when the order “hit the standpipe” is transmitted, and the crew carries the high-rise pack up the stairwell? In that instant we have succumbed to one of our greatest downfalls on the fireground—failure to communicate. We will do ourselves just a little more justice if we can break ourselves from tradition (gasp!) and begin to address this equipment correctly. FDCs are required on nearly all sprinkler systems installed to National Fire Protection Association (NFPA) 13, Standard for the Installation of Sprinkler Systems, 2007 and 2010 editions, and NFPA 13R, Standard for the Installation of Sprinkler Systems in Residential Occupancies Up to and Including Four Stories in Height, 2007 and 2010 editions. There are a few exceptions that contemplate buildings which are too remote where fire department intervention is not likely and which are so small as to not receive any benefit. The overwhelming majority of properties in our communities do not reflect those conditions, and it’s probably a safe bet that we all have operated and will someday operate at a sprinkler- or standpipe-protected property. According to one national standard, the FDC is intended to provide sprinkler systems with a means to receive supplemental water support from fire department pumping apparatus. I offer that the term “supplemental” is only relative to whether or not a reliable and adequate supply is being automatically provided. In cases where buildings have been shut down or abandoned, we often find the utility water service removed even though such removal is generally prohibited in the model fire codes. Events such as floods, hurricanes, tornados, earthquakes, and similar events can interrupt utility-provided water either because of loss of power to pumping stations or damage to the water supply infrastructure piping. If these events were to interrupt the automatic water supply to a sprinkler system, then the only possibility of providing water to the sprinkler would be through the FDC. Fire departments are generally able to provide water supplies through tankers, shuttles, and drafting during such events long before the utility system is restored. There’s nothing supplemental about water in those circumstances; therefore, the FDC should be given strong consideration for its potential to be the only water source to a system during a fire. After all, when has everything gone right on the fireground? It is of paramount importance that providing a reliable and adequate supply of water is an immediate operation when arriving at a fire in an FDC-equipped building, regardless of whether that connection serves a sprinkler, a standpipe, or both. It should also be mentioned that Annex language to Section 6.8.1 in the 2007 edition of NFPA 13 reinforces the supplemental nature of FDCs and that they do not necessarily supply the system demand, nor are they intended to deliver a specific volume of water, but rather that an FDC provide a desirable, auxiliary supply to increase overall system reliability. Later in this article, we will discuss a recent change to that standard that now limits the amount of desired supplementary support an FDC could provide. Long before a building catches fire, we need to plan for that fire. There are people who are charged with the responsibility for ensuring an accessible FDC is provided for responding personnel and apparatus. Regardless of how your local system of construction enforcement and inspections is operated, one person (or more) is responsible for placing and installing the FDC. He may be called an inspector, a plan reviewer, a building official, a fire marshal, and so on and may not necessarily have a fire service background. That individual may never have had to find or make a connection on a dark snowy night, and he just may not have a clear understanding of how you, as the responding fire agency, will look to use that connection. Location, location, location … I’m sure we have all heard that phrase used in dozens of instances during the course of our careers. The FDC is no exception to that: It must be in the “right” location from day one. Depending on what codes or standards are in effect in your jurisdiction, you should be aware of what those documents require for positioning and placing the FDC. Learn to use the codes just as you use any other tool on the apparatus. The International Fire Code (IFC), 2009 edition, provides extensive language in Section 912 to ensure everything needed to effect immediate access to an FDC. The code stipulates that FDCs (there may be more than one on a building) be positioned on the street side of the building and be fully visible and recognizable from the street or point of fire department vehicle access. The code expands this further by requiring that the engine and its hoselines do not obstruct access to the building for other apparatus when connected to the FDC. The code language is very clear here, and we have all seen more than one occasion where positioning apparatus at an FDC is compromised, blocked, or obstructed (photo 1). Primarily, the ladder company is most restricted on where it can position at a building to achieve ladder access or for aerial master stream operation. There is no reason for the first-due engine and its hoselines to obstruct or diminish that area of operability. The last thing we want is the engine company to delay or forgo connecting to the FDC while waiting for the arrival of the ladder before blocking the building access driveway or approach, yet we see this scenario time and again. All this, and we haven’t even gotten to the other code sections that further restrict obstruction by fences, trees, landscaping, or other fixed or moveable barriers. Does the proper location for the FDC create a risk of physical impact damage from motor vehicles or fork trucks? If so, then apply the code section that requires physical impact protection. There is a provision for fences because buildings have security factors and needs that must be considered; just keep in mind that the access gate must meet the code requirements for clearance and working space along with the fire department’s needs for access and that the fire chief must approve the entire matter (photo 2). Always keep the words “immediately accessible” in mind when entertaining any request for variances or deviations. If your local agency does not enforce the IFC, you are not entirely out of luck because the NFPA 13 (2007 edition) standard also contains language with the same purpose and intent, although it is not as specific and leaves a lot of the clear language in the Annex of Section 8.17. If you happen to legally enforce both documents, then use them to achieve “immediately accessible” FDCs to best serve your agency. It is important to note here that in the NFPA 13R standard (residential buildings up to and including four stories in height), there are no regulations or limitations for FDC location or accessibility. If you do not enforce the IFC, you may want to consider local amendments or other regulatory processes to provide for language that ensures you can enforce “immediately accessible” and otherwise unobstructed FDCs on those residential systems. A similar scenario exists if you enforce NFPA 5000, Building Construction and Safety Code®, 2009 edition, as your building code, which sends you directly to the referenced standards for FDC requirements. In addition to those items above, also consider the position of the FDC on the building relative to the nearest hydrant or water source for firefighting purposes. There is no code requirement in the sprinkler standards (NFPA 13 and 13R) to regulate this, but generally anything less than 100 feet serves the purpose and allows even a limited engine crew to effectively support an FDC without difficulty. There is, however, a requirement for standpipe systems (NFPA 14, Standard for the Installation of Standpipes and Hose Systems, 2007 and 2010 editions) that a hydrant be positioned within 100 feet of the FDC. In this case, we have absolute authority to regulate the FDC position or the installation of a new or additional hydrant to properly serve the building. Just as it is undesirable to have a hydrant too far from the connection, it is just as undesirable to have a hydrant sitting at the FDC. Although this may seem ideal, consider the effects of blocking or obstructing building access by parking the pump apparatus on the hydrant in front of the FDC (prohibited by code) and also the implications of placing apparatus within the building collapse zone. It may be well worth the time to drive to a site to position apparatus and lay dry lines when determining the optimal locations for the hydrant and the FDC. The code considers the need for timely effective support of the FDC as personnel need to rapidly secure a reliable water supply into the connection before operating off the building standpipe hose valves. During the planning stages, the FDC must be regulated to uphold the “immediately accessible” doctrine as well as the nearest hydrant for a continuous water supply. Fire department connections are required to be marked with minimum signage, which is clearly spelled out in the codes. If we go back to the IFC (2009), Section 912, we find that metal signage with raised letters at least one inch high is required. The code also requires specific verbiage such as “automatic sprinklers,” ”standpipes,” “test connection,” or a combination thereof, depending on actual building conditions (photos 3-4). Does it sound complicated? It shouldn’t. The major fire equipment manufacturers already ensure code compliance can be easily achieved by stocking pipe escutcheon rings that are properly constructed of metal with raised lettering that meet the exact requirements of the code along with several other options, including contrasting red and white colors to cover most common system installations. I wish I could tell you I’ve never seen an automatic sprinkler ring installed on a building without sprinklers; apparently, someone doesn’t know they make it with standpipes printed on it also. The example shown in photo 5 would prove disastrous in an emergency if the proper and corrected signage had not been ordered by fire department inspectors (photo 6). There is also language to provide supplemental signage when an FDC-connected system does not serve an entire building. Again, this should seem obvious, but it is routinely overlooked and can lead to critical decision errors on the fireground. There are situations where it is permissible to provide protection only in certain building areas or occupancies. An FDC for a basement-only sprinkler system is of little value to firefighters when they are faced with a top-floor fire in a three-story taxpayer. Examples of such signage are shown in photos 7-8 and are not specifically regulated by the codes, so local officials will have to be specific as to size, material, color, and even content editing (photo 9) to avoid creating more confusion than necessary. As with the requirements for “immediately accessible locations,” keep in mind relative to signage that the intent of the code is to provide responders with specific system information to ensure proper support. It is entirely impractical to expect personnel to remember quirky things about every FDC or building in the jurisdiction. No preplan program was ever meant to compensate for failure to apply the proper code requirements. It should go without saying that the hose connections on an FDC must be compatible with those of the local responding fire apparatus; unfortunately, time and again we find connections that do not have the proper thread type to mate with the local fire department threads. There are many explanations for how this occurs during system installation, but the bottom line is that although the code requires compliance, if no one ever checks, then it should not be a surprise when an emergency finally discloses a problem. There is no explanation or excuse for not checking an installation immediately after it is completed. We know that all prevailing codes and standards require these connections to be immediately accessible, so a crew out training can easily pull over and check the hose connections without disrupting any aspect of the site or the building occupants. Ensuring the connection is compatible with local threads also helps the crews to become aware of and familiar with various properties in their district. Even if the threads are compatible with those of your local fire agency, this type of ongoing spot checking will reveal connections that have been damaged or vandalized that should be reported so they can be repaired. In addition, all personnel need to be aware of which end of the hose is being stretched and connected to an FDC. NFPA 13 specifically calls for female swivel fittings on the FDC; this is consistent across the fire service. When hoselines are connected and pumping into an FDC, they are in effect attack lines—even though we may see them as supplying water to the sprinklers or standpipe. The reason this becomes important on the fireground is that some hose connections resemble an FDC but, in actuality, are not intended for fire department support. In buildings with a fire pump, there is generally an exterior test header that almost mirrors an FDC, except that it has male-threaded hose connections. Without clear and correct markings or signage, it is possible that a crew might attempt to connect to a test header with a pair of double-female swivels. Although done with all good intentions, this will have no effect on supporting the systems. An example of this potential for confusion is shown in photo 10, where the left-side connection serves as an FDC and the right-side connection is really a fire pump test header. 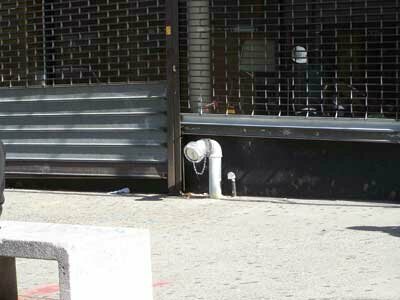 Similarly, there are premises that are equipped with wall hydrants that closely resemble FDCs. Once again, the need for clear and legible signage is evident. Personnel should make particular note of and discuss the key differences among these connections when they are found during inspections. If you encounter male-threaded hose fittings on a connection when responding to an emergency, immediately suspect a fire pump test header or a wall hydrant and seek additional information before pumping to it. To achieve effective support of an FDC, the apparatus ideally should be positioned such that the hoselay between the pump and the FDC does not exceed 100 feet. Since you will be stretching multiple lines to this connection, do not be indiscriminate with the lengths of hose you use, given time and personnel considerations. Generally, the FDC manufacturers rate each 2½-inch hose connection as delivering 250 gallons per minute (gpm) to the system at 100 pounds per square inch (psi). Depending on whether your apparatus carries 2½- or three-inch hose for connection to an FDC, you can estimate the amount of water that will be delivered to the FDC. On average, a 100-foot run of 2½-inch hose has a friction loss of 12 psi @ 250 gpm, and a 100-foot length of three-inch hose will lose 5 psi @ 250 gpm. Under heavy fire conditions, it is possible that the three-inch line can be pressurized to 175 psi to deliver 500 gpm, but that will generate approximately 20 psi of friction loss. Such flows and pressures are not recommended with 2½-inch hose, as the friction loss exceeds 35 psi. Those instances represent heavy fire conditions that are likely to overpower the building sprinkler system or multiple handlines operating off a standpipe riser. Problem: The higher the pump discharge pressure provided to that connection, the greater the friction loss becomes, and that can reduce the actual throughput of water into that FDC. Solution: For large system demand, you need FDCs with more than two hose connections. It is very difficult to deliver a large volume of water at the necessary operating pressure through only two 2½- or three-inch hoselines to an FDC, particularly above 1,000 gpm. When faced with vertically challenging buildings or large-area structures, it is hydraulically beneficial to supply three or even four hoselines to support the sprinkler or standpipe systems. This would necessitate the installation of an FDC with more than two 2½-inch connections and a more proactive approach during the plan review and construction phases of a project. This is where the language of NFPA 13, 2010 edition, Section 6.8.1 can cause some difficulty. 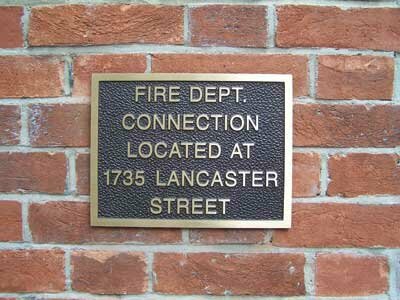 It reads, “… the fire department connection shall consist of two 2½” connections ….” Prior to the 2007 edition, the wording in this section called for at least one hose connection, and local authorities had latitude to require connections with two or more hose connections. The use of the mandatory “shall” language in the 2007 edition could have an undesired effect on the fire department’s pumping apparatus’ ability to provide a desired auxiliary supply. This language now effectively limits an FDC to only two hose connections. Regulatory authorities should consider creating local amendments that revert to the prior language or place the final determination in the hands of the local fire authority that will be dealing with the matter of a fire and public safety. It is not in the best interest of fireground operations to be bound to hard-and-fast language that limits the amount of auxiliary support fire department pumping apparatus can provide to a building sprinkler system. A clarification is in order here: The above code section and its FDC limitation are applicable only to stand-alone sprinkler systems installed in accordance with NFPA 13. If you have a project with a standpipe system or a combined sprinkler standpipe system, you will be applying the requirements of NFPA 14. The FDC requirements in NFPA 14, 2010 edition, Section 7.12.3 are more restrictive and specifically call for FDCs to have one 2½-inch hose connection for each 250 gpm of system demand. Although it is entirely permissible to install a combined sprinkler and standpipe system that could be supported through one FDC on the premises, the requirements of both standards must be met, including those requiring more restrictive FDC capacity. While discussing the specific requirements of NFPA 14 for standpipe system FDCs, it is also important to point out that there is specific code language that can require more than one FDC on a protected property. In Section 7.12, the code states, “one or more FDCs shall be provided …,” which can help the local authority establish the need for two or more FDCs on a standpipe-protected property. Furthermore, the code requires at least two remotely located FDCs on high-rise buildings. The prevailing building code adopted in your jurisdiction will define a high-rise building (typically 75-plus feet above the fire department vehicle’s access) and when a standpipe system is required. Understanding the differences in the code language is the key to ensuring that all requirements are met and, where permitted, local authorities can establish the need for more than a single traditional “siamese” connection, which is often not adequate to deliver the water required to supply to these systems. Traditionally, the fire service has considered the standard FDC as being equipped with two 2½-inch female swivel connections; I believe this gave way to the “siamese” designation. However, there are numerous other connection configurations commercially available, ranging from single connection to four-way connections. They are also available for wall mounting or as pedestal mounts, depending on site conditions. In recent years, the fire service has seen the introduction of sexless or quick-connect type fittings on system FDCs typically with four- or five-inch hose. The local fire authority would make the selection, since compatibility with hose fittings is required. There are, however, some things that need to be considered when using these fittings and large-diameter hose (LDH) for supplying system FDCs. These considerations should be part of any discussion on changing over to LDH connections for existing systems or using them for new system installations. LDH was introduced to the fire service as a means to provide large volumes of water over long distances with reduced friction loss compared with traditional 2½- or three-inch supply lines. This advantage of large volume and reduced friction loss did not contemplate appreciable pressure loss caused by elevation, such as in standpipes for high-rise buildings. LDH supplies volume to pumper apparatus, which then produce the necessary operating pressures for firefighting operations. Fire sprinkler and standpipe systems rely on specific pressures at certain volumes to achieve effective sprinkler coverage or hose stream reach and penetration. Successful usage of LDH to move large volumes of water is also dependent on the pumping apparatus’ design and piping. The installation of an adapter to convert an existing 2½-inch discharge into a five-inch discharge creates a chokepoint at the pump discharge where water velocity will be greatly increased and result in additional friction loss as flow volume increases. You must also consider the hose. Since LDH is generally classified as supply hose, its service pressure is 200 psi, whereas three-inch hose is available with service pressure listings from 300 to 600 psi. When looking at the requirements for properly supplying standpipe systems in vertical buildings, particularly multizone systems, you will encounter minimum pressures well beyond 200 psi. Although the friction loss in the 100 feet of hose between the pumper apparatus and the FDC will be less in the LDH, do not overlook the fact that pumping 175 psi through the LDH and supplying upward of 1,000 gpm is wholly inadequate for the companies operating off the standpipe system if it will take 250 psi and 750 gpm to actually reach them and support their hose streams. The use of three or more three-inch hoselines into the FDC will easily deliver beyond that 750 gpm; more importantly, it will deliver it with the necessary pressure to overcome the elevation loss (gravity) in reaching those crews. Large-demand sprinkler systems or standpipes that require flows of more than 750 gpm are still better served by multiple (three or more) hoselines through a three- or four-way FDC. When you consider the needs to properly supply a multizone building (discussed below), very few pumping apparatus are equipped to properly support two or more LDH discharges. The most basic engine apparatus will have at least six discharges for 2½-inch hose couplings, which can feed three lines into each FDC on two different zones. With this popularization of LDH, many agencies began to remove three-inch hose from their apparatus and use LDH for their supply lines. This is not a question of using LDH as a supply between hydrants and apparatus; it’s about recognizing that while you may be “supplying” the FDC, you are actually on the discharge side of the pump and you should be using “attack”-rated hose to connect to the FDC. Although it is not necessary in these cases to carry 1,000 feet of three-inch hose, consider your response area and its building makeup. Fire departments still must maintain some complement of three-inch hose on their attack apparatus to properly provide for the vital function of supporting an FDC. At the height of a firefight in a standpiped building, the interior crews are relying on the water supply through the FDC for their protection and safety. In a building equipped with a single large-diameter FDC, there is one and only one hoseline between the fire pumping apparatus and the building. If the hoseline is damaged by falling debris, driven over by an errant vehicle, or ruptured by pressurization, that singular hoseline becomes lost and instantly endangers the interior crews. Several minutes would be needed to stretch and reconnect a new hoseline while interior crews scramble for cover and safety in deteriorating conditions. When multiple hoselines, even two, are in place and are supporting the FDC, it provides a safety factor if one of the hoselines is lost or damaged. Interior crews should use the water remaining in the additional FDC lines to retreat to a protected stairwell with hoseline protection. The codes have traditionally required that FDCs be positioned between 18 and 42 inches above the adjacent grade level. The lower measurement takes into consideration accessibility during snowfalls and snow drifting; the upper measurement considers ease of reach and connection but also the weight of water-filled hoselines pulling at their fittings and kinking. The impact of water weight and pull on couplings is dramatically compounded in LDH, as a single foot of five-inch hose weighs approximately 34½ pounds when filled with water. The higher an FDC is mounted, the more hose length that must be supported by the fitting before the hose makes ground contact—at 42 inches high, about 121 pounds of water would be hanging on the connection (photo 11). This also increases kinking of the hoseline, which in turn reduces and may eliminate the hydraulic efficiency of a LDH. A charged three-inch line has enough rigidity so that it would be relatively self-supporting at even 42 inches above-grade, but a charged five-inch hoseline has no self-supporting characteristics and will immediately create a kink and pull at the coupling-to-FDC. Some agencies have been stipulating the installation of a pipe elbow to alleviate this condition (photo 12), but we must still remember that height is working to our disadvantage here and the codes have not contemplated the use of LDH for FDCs. A similar effect can occur on FDCs that are low to the ground (photo 13). When you include the size of the hose coupling, you force a kink to occur under the connection that, once again, robs hydraulic throughput and defeats any advantage of LDH. Early LDH couplings lacked a physical means for retaining their connection, and they were just friction twisted together with as little as a ¼- to ½-turn action. Today, we have large-diameter connections with a ¼-turn twist action and a safety latch to physically hold them connected. There is no question about the value of or need for this safety latch, and we can regularly inspect and maintain our hose. When using these connections on an FDC, we have much less control over the care and maintenance of this safety latch; if it becomes broken or damaged, we have no reliable means to restore it in an emergency. This increases the possibility that the hose connection will fail or separate under pressure and deprive interior crews of water. When using traditional hose sizes, we rely on hose threads that make up their connection over several turns vs. a fractional turn. If a threaded hose connection is found damaged, responding personnel have several options for making a rapid field repair and achieving a timely hose connection to allow for support through the FDC. A failed or damaged large-diameter connection effectively renders it useless for the duration of the fire emergency and must be repaired by a service contractor. Inevitably, you will encounter a property that has an FDC that has become damaged or otherwise impaired. Catching these problems during an inspection can facilitate repairs, but we must know what we can do during an emergency to work around the problem and provide some level of support to a sprinkler or standpipe system. As a result of constant exterior weather exposure and susceptibility to damage from impacts, the swivels on an FDC can become damaged or frozen in position. It would appear nearly impossible to connect a hose length male fitting to a frozen female fitting, as the twisting hose would effectively shut off water delivery. There are two methods for overcoming this condition in an emergency that do not necessitate special equipment or cause exceptional time delays. Action 1. Employ a double-male adapter into the frozen coupling, making a typical hose-tight connection. You now have a fixed male fitting exposed; connect it to a double female adapter, and complete with a hose-tight connection. Although it may be unsightly, you now have a functional female swivel fitting that you can easily connect to the male end of your supply hose. Action 2. Twist the hoseline, and let it unwrap itself into the frozen swivel. On completing the stretch of supply hose from the pump to the FDC, and while holding the male coupling and facing the FDC, twist the male end of the supply hose in a counterclockwise direction approximately three to four turns. This will cause twisting of the supply hose, which will then be relieved by connecting the male fitting into the frozen female and untwisting the supply hose in the opposite direction. This relieves the twists and completes the necessary turns to thread the fittings together. This method may not achieve a leakproof connection, but it offers an option when necessary. This method takes time and practice to develop so that it does not become a fumbling act in an emergency. Given the fact that reduced lighting, temperature, and time pressure are usually conspiring against us on the fireground, I suggest the first method of using a set of double male and double female adapters to overcome a stuck swivel. Most engine apparatus have a few sets onboard, and firefighters are already skilled at making connections in different types of weather and lighting levels. A stuck or cross-threaded plug on the FDC female swivel that you cannot remove would preclude the completion of a hose connection to that side of the FDC and would reduce the delivery of water volume to that system. Generally speaking, it is far less common to find both plugs stuck or frozen on the FDC, and this all serves to support the need for personnel to fully check all swivels and fittings on FDCs during field inspections and activated alarm runs. These problems rarely happen overnight and are attributed to neglect and lack of maintenance over time. Action 1. If a plug is truly frozen and can’t be removed, it is better to just leave it than to expend the energy to remove it and find out the swivel is damaged or out of round and you are unable to make a hose connection to it. Either way, you are unable to make the hose connection, but at least the FDC is still usable through the other hose connections. It would just compound the problem to remove the plug and find that the clapper is also damaged or missing and any attempt to provide hydraulic support would simply be blown all over the outside of the building. Make all the good hose connections you can, and do not let a stuck plug cause you to abandon all efforts to support the FDC. Action 2. As an alternative to providing only one hoseline, you can connect a wye (gated or not) with a double-male adapter to the remaining good hose connection. You then can provide two hoselines to the wye adapter and into the FDC with better flow results than with just a single hoseline. A worst-case scenario is an FDC that is truly damaged to the extent that it is not usable. Changes in economic conditions across the nation have led to problems in areas where FDC components are being salvaged for scrap value, leaving unusable connections on many buildings (photo 14). Actions. When faced with a protected property that has such an FDC, officers and commanders need to conduct a risk-benefit analysis. If the protected property has a sprinkler system, the fire service can do little to provide supplementary support for the system. The action is to not draw down on the existing water supply into the building sprinkler system. This would require additional apparatus and hose to connect to hydrants on other portions of the underground distribution system to provide adequate water for fire department operations, which will likely involve master streams if the sprinkler is unable to achieve control. Constantly reevaluate the fire attack plan, the progress of the fire, and the effectiveness of the sprinkler system. If there is no measurable progress, consider changing attack modes and anticipating building loss. In rare circumstances, the charged FDC can suddenly and often violently come loose and separate from its piping in the building or underground while operating at building fires. Obviously, this poses a safety risk to personnel in the immediate area; it also jeopardizes any interior crews that are depending on adequate hose streams for protection. Many times, this type of failure has led to the loss of the building. Officers and commanders should recognize this situation and remove personnel from locations where they cannot be protected with adequate hose streams or when sprinkler systems cannot be supported with an adequate water supply to achieve control or suppression. These problems can often be traced to installation deficiencies or undetected damage and not something the fire department did during the fire. When systems are being installed, inspection personnel must pay particular attention to the FDC and its associated piping to ensure they are being installed in compliance with the code, especially piping bracing and support. Although FDC piping spends the majority of its life idle, there are times when it is subjected to the pressure and flow forces produced by a pumping apparatus developing pressures of 150 psi and greater. The movement of large volumes of water through system piping at those pressures creates force and movement that must be absorbed through mechanical bracing and supports. If such supports aren’t provided, the piping can literally shake or blow itself apart, rendering the system impaired and unable to receive fire department support. There should be no movement in an FDC when a firefighter firmly grabs and shakes it. If you can wiggle or move the connection with your hands, imagine what will happen when water is flowing into it from the supporting fire department apparatus. FDCs, particularly those remotely located from the building, can be struck by vehicles and sustain damage that isn’t always apparent in visual inspections (photo 15). During a response to an alarm malfunction at a sprinkler-protected property, the crews took the time to inspect the FDC’s condition. In the initial photograph (photo 16), the connection appeared normal and in a condition that would not have normally promoted any further investigation. On contacting the FDC, it was found damaged, and the entire connection freely swung between the 10 o’clock and 2 o’clock positions (photos 17-18). This clearly needed further attention, and repairs were ordered. This example underscores the need for officers and firefighters to adopt a standard approach to inspecting FDCs during responses to protected properties. A simple inspection of the FDC, including the swivels, thread compatibility, system identification signs, coverage area signs, overall accessibility, protective caps/plugs, support, and bracing, can be easily performed in minutes. This simplified inspection also serves to enhance members’ familiarity with the FDC location and can generate tailboard discussions about future operations at the property. When an incapacitated FDC serves a standpipe system, the situation becomes more urgent, as it represents the source of water for interior hoselines. Command decisions must be based on the fact that it is inherently dangerous to send personnel into the building for fire attack without the ability to properly supply and support their operating hoselines. Alternate measures would have to take into account the reflex time and exceptional resources necessary to advance a supply line vertically through the building—and that it is not really practical beyond the third or fourth floor. The reason the standpipe was installed in the first place was that the codes acknowledge that it is impractical to manually advance a hoseline from the exterior beyond the third floor of a building. Option. Another option, with no promises, is to raise an aerial device, preferably with a platform, to a floor below the fire and use it as an improvised exterior standpipe to supply interior hoselines. This concept is immediately limited by the effective reach of the aerial relative to the building site, floor layout, and actual fire location. It also would necessitate that personnel enter the floor below from an open area without the protection of the enclosed stairwell, where they would normally be ascending. Once entry is made on the floor below, it may take additional and possibly exceptional hose stretches to find the interior stairs and then ascend to the fire floor for attack. Consider such an operation only when there is a legitimate life risk above the fire floor and personnel have adequate preplan knowledge to enter an open floor area and efficiently locate the interior stairs. Beyond those considerations, an exterior/defensive operation is the only reasonable plan left to attempt. This reinforces the code requirement that high-rise buildings be equipped with at least two remotely located FDCs. It becomes less likely that both FDCs would be damaged beyond function; at least some level of support could be provided into the standpipe system. Over the years, there has been discussion that you can overcome a damaged FDC on a standpipe system by stretching a supply line into the building and connecting it to a lower-level hose valve and opening the valve—essentially back-feeding the standpipe through a hose valve. I am not summarily dismissing this concept; however, there are some inherent limitations to the concept, and it should not be considered a universal solution to the problem of an incapacitated FDC. There are limitations to this approach. If it were universally acceptable and feasible to back-feed every standpipe system through a lower-level hose valve, that would be taught and would be recognized as a best practice! One immediate limitation to this approach is the volume that can be delivered to the system. 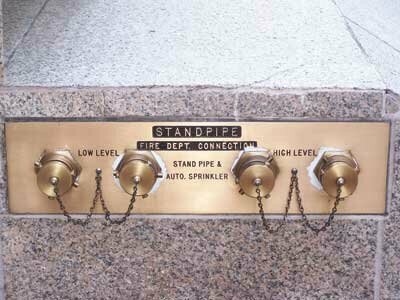 Most standpipe systems are designed for at least 500 gpm and often 750 gpm to 1,250 gpm. These volumes represent the number of hoselines that may be required to extinguish a fire in various occupancies. The largest flow designs apply to buildings that are not sprinkler protected, as we can expect fire to quickly develop, especially in open-floor-plan office and professional occupancies. Residential occupancies generally have lower flow designs partly because of the compartmentalized design of the floors with fire resistance rated assemblies between units and the corridors. That is not meant, however, to diminish the need for reliable hose stream support when operating off a standpipe in a residential occupancy, particularly in older buildings that do not have sprinkler protection. It becomes impractical to attempt to deliver enough water through a single back-fed hose valve to support more than one or possibly two operating hoselines. Such limitations severely limit crews’ simultaneously performing main fire attack and also advancing into exposure floors to cut off extension. It is unsafe to commit crews to positions where they are connecting and advancing three or more hoselines into conditions where they are expected to encounter fire while giving only the standpipe enough water support to supply one or two of those hoselines at a time. Four hoselines that all have inadequate flow and stream penetration are less effective and more dangerous that one or two hoselines with good flow and stream penetration making a stand to cut off further extension while the main body of fire consumes its available fuels and is unable to spread. When faced with several detached structures on a city block involved or immediately imperiled, we opt for a defensive attack where we write off areas already involved and focus our resources on preventing the involvement of more exposures. This same concept can be safely and effectively applied to an interior building fire when you are unable to adequately support enough hoselines to safely accomplish an offensive attack against the fire. Another limitation that can sometimes be remedied in the field is the presence of a pressure-regulating device on the hose valve. Depending on the style of this device, it may either be threaded onto the hose valve or cast into the body of the hose valve. The key is to recognize the presence of the device and to overcome its limiting function if possible. You can easily achieve this when the device is threaded into or onto the hose valve by simply removing it like any other hose fitting prior to connecting your supply hose. Remember to fully open the hose valve by the wheel or handle before charging your supply line. In the rush of the moment, you might make your hose connection to the valve and then charge the supply hose. The supply hose will become hard and appear to be performing its supply function; however, the water will not be flowing back into the standpipe riser. Since we are not accustomed to opening valves when connecting to an FDC, slow down and think through the evolution to make sure you do not overlook something that appears so simple. When you encounter a pressure-regulating device built into the valve body, you must override the device to allow full port flow through the valve and into the standpipe riser. Depending on the types of pressure-regulating devices within your jurisdiction, this may be as simple as removing a limiting pin (photo 19), or you may need a field adjustment tool/wrench/pin. There still are plenty of nonadjustable standpipe valves in existing buildings, and you cannot field adjust them, which will severely limit your attempt to back-feed the system or may render the effort futile. Familiarity through preplanning will help you identify these conditions ahead of time; make them part of the documented records in your preplan files. A less obvious condition that would impair or prohibit effectively back-feeding a standpipe riser are in-line pressure-regulating devices and check valves in the system piping. When present, these devices are capable of regulating system pressures without being visible or apparent at the hose valve or riser. Their purpose in the system is to regulate pressures and control flows under normal operating conditions. An attempt to overcome an incapacitated FDC through back-feeding a hose valve is anything but normal operating conditions; therefore, these valves can easily impair or prohibit such operations without your knowledge. Check valves can be required by the codes, depending on piping configurations and the presence of multiple water sources, including elevated storage tanks, to prevent siphoning of the entire system during maintenance and repairs. Under normal operating conditions, they pose no obstacle to proper flow and are typically hidden from immediate sight. Even if you were aware of their presence in the system, there is nothing you can do to bypass or overcome them in an emergency short of removing them and replacing them with a piece of straightway piping. Similarly, a large pressure-regulating device can be located in a ceiling or service closet to regulate the downstream flow to several floors or an entire zone of a building vs. individual pressure-regulating devices at individual hose valves. Your approach to overcoming an incapacitated FDC and supporting a standpipe system should be guided by your knowledge and an understanding that there really are no silver bullet solutions to these problems. Your best bet is to attempt each of the remedies presented and observe the results. Given your available resources, undertake more than one of these corrective measures simultaneously because all the while the fire is continuing to gain intensity and spread to other areas. The best measure of your progress or effectiveness with any emergency measure is the direct feedback from personnel at the hose valve below the fire floor. As long as it remains safe and feasible to stage an interior attack, you can obtain direct feedback on your efforts from those crews. From a position of relative safety within the stairwell enclosure, they can operate the hose valve and observe flow and pressure conditions even before connecting the attack hoseline and considering making an advance onto the fire floor. While this type of “indiscriminate” water flowing into the stairwell may seem like needless property damage, keep in mind that a fire is spreading unchecked through the building and the best possible outcome of this event is predicated on whether or not your emergency measures can establish a reliable water supply for the interior crews. From our earliest fire school days, we are taught some very basic facts about operating at sprinkler-protected properties. I remember the emphasis placed on the piping of the FDC into the system risers as being an absolute in that even if an intentional act shut water off to the sprinklers, that water could be pumped through the FDC and into the system. Well, now is a good time to realize the inherent limitations of that statement. First, the regulations have prohibited control valves in the FDC line for decades. It is absolutely forbidden to install any type of control valve in the piping between the FDC and the system. This means there are no isolation or service valves provided for the FDC check valve, a specific exception from general practice that check valves can be isolated for servicing. The statement that an FDC will always provide water from pumping apparatus into the system even in the case of a closed supply valve is misleading. The reality is that in a single-riser sprinkler system, either wet or dry, a properly installed FDC will allow pumping apparatus to supply systems even when the water supply valves are closed. This applies only to single-riser systems and would generally apply to “most” installations. When a property is protected by a multiriser system, however, those risers are typically manifolded between the water supply and the base of the riser, which places a riser control valve between the FDC and any of the system risers. Should a riser control valve be shut for any reason and the fire occurs within the protected area of that riser, then no water could be supplied into the operating area. Note that FDCs are not specifically intended to overcome system impairments from closed valves. This understanding further reinforces the need for responders to quickly access control valves or riser rooms and verify the operational status of the equipment during an emergency. This would be the only means by which a closed riser control valve could be corrected to allow water to flow into the fire area. These considerations should never preempt or delay action by responding apparatus to secure a reliable water supply and complete connections to an FDC in anticipation of a full system support evolution. FDC location. On arriving at a fire in a large-area recycling facility, the IC elected to skip supplying the FDC as he had concerns about positioning apparatus in the building collapse zone instead of opting for multiple aerial streams. The fire eventually burned long enough to collapse the roof and allow aerial streams to penetrate and suppress the fire. Although building collapse and firefighter safety are absolute priorities, there is no need to commit apparatus into a position of collapse danger. At the time of your arrival, hoselines can often be safely connected to the FDC and the apparatus moved well out of the hazard area while maintaining support of the system. If lightweight building construction methods create the concern of early collapse, the FDC should be located remotely from the building or at a low corner. Supporting the FDC can be done effectively without apparatus being committed into a collapse zone provided consideration was given to such operations during planning and construction. This also illustrates the value of remotely located or multiple FDCs on large-area and high-rise buildings. Multizone standpipe/sprinkler systems. The delivery of adequate pressure and volume to buildings that have exceptional height goes well beyond fire department operations. The initial design and configuration of sprinkler and standpipe systems in buildings of 20 or more floors will often require more than one “pressure” zone. These multiple zones may be independently supplied with individual fire pumps, or they may share equipment for inline pumping configurations. The building configurations are up to the designers, who must act within the boundaries of the various codes and standards. This brings us back to the matter of developing good preincident plans and ensuring that such information is available in an emergency. From the operations standpoint, a building with more than one zone can create the appearance of “complicated and confusing” systems. We learned earlier about the requirement for two or more FDCs for each zone in high-rise buildings and that a basic three-zone building would have six FDCs, hopefully grouped by three and located on two remote portions of the building exterior. The need for clear and understandable signage is of paramount importance so as to avoid confusion when making those connections. Although it is unlikely that a single fire would require connecting hoselines to all three zones, it is quite possible that connections to two of the zones would be necessary. Let’s create a theoretical building for our discussion, to help illustrate the concept of multiple zones and how it affects your operations. Our building is a 35-story office center that also has a four-level parking structure underground and below street level. The automatic city water supply will enter underground at one of those garage levels. This supply will have enough pressure to cover all garage levels and the first four floors above grade in the building, constituting the first zone. A fire pump is employed to increase pressure for the sprinklers and standpipes from the fifth to the 20th floors, which constitutes the second zone. The third zone employs a fire pump on the 20th floor, which boosts pressure once again and feeds the 21st floor to the roof. This fire pump configuration is similar to relay pumping using two engine apparatus and is generally referred to as “pumps in series” by the codes. Each of these three zones would have at least two FDCs installed on the building exterior, as determined by the needs of the fire department and available apparatus access to the building. Depending on which system zone you need to support, the inlet pressure to those FDCs will be different. The first zone obviously will not require as much pressure as the third zone. Signage should include clearly marked zones and their coverage areas and the maximum and minimum inlet pressure requirements for each zone. Note: The zones must be identified, not merely labeled (photo 20); here only the high- and the low-zone connections are identified. There is no indication for firefighters of what defines the low and the high zones, which would generally be floor numbers. The signs in photos 21 and 22 are more accurate and provide usable information for firefighters. This extra information can help firefighters to achieve the best possible outcome in an emergency. Previously, it was mentioned that the likelihood of a single-fire event that would necessitate connection to all zones is very remote. There is, however, a distinct possibility that connecting to two different zones at a single fire is necessary, and there should not be any mindset that rules out that possibility. When operating in the vicinity of the interface floors near adjacent zones, there must be hoselines connected to the FDC for that adjacent zone. Let’s take another look at our example building and suppose a fire occurs on the sixth floor. A response is generated by the automatic alarm for water flow on the sixth floor; other signals will be generated during our response as smoke travels toward stairs or elevators and occupants activate manual pull stations. One of the important size-up factors is that the initial water-flow alarm is from the sixth floor—initial attack planning should focus on this area. As that information is broadcast to responding apparatus, the companies designated to both remotely located FDCs will find that the sixth floor is part of the second zone serving the fifth to the 20th floors. This would be the correct FDC to make hose connections with and prepare for supporting operations. Don’t stop there. Although the fire may be on the sixth floor, we know our procedures call for connecting to the floor below the fire, which would be the fifth floor. This is no problem, since the fifth floor also happens to be part of the second zone. The missing piece of the puzzle, which may not be immediately known to the pump operators, is the presence of scissor stairs in the building and that the hose valve below the sixth floor (fire floor) in the designated attack stairwell is actually the fourth floor of the building. This means the initial attack hoselines will be drawing water from the first system zone and would leave those crews without support from the pumping apparatus. The scenario can also go the other way: The crews connect to a floor that is close to the upper limit of a given zone. They are making progress and are not reporting any water supply problems. Additional companies are detailed above the fire floor for exposure control; they tie in and are now on the lowest level of the next system zone above the fire. When those crews begin to operate, they may suddenly report water supply problems while crews only one or two floors below have adequate flow and pressure. This can lead to confusion and even injury on the fireground as a pump operator begins to increase pressure to overcome the problem and reports of low pressure and flow continue. While this is happening, the lower zone is being overpressurized, and those crews are suddenly faced with pressure surges. The best way to overcome either type of scenario is to make hose connections to the adjacent zone FDC whenever crews are operating within three to five floors of a zone interface. You do not have to immediately pressurize both zones from the incident onset, but at least the hoselines are already in position and connected should support to the adjacent zone become necessary. The interior companies can also help prevent a problem by communicating which floor they are connecting to prior to making their attack. The fire floor doesn’t change in the scenario, but if a crew reported it was connecting on the fourth floor because of scissor stairs, the outside pump operator can immediately adjust the operation to supply the lower zone as well as the upper zone (fire floor). The zone containing the fire floor will always require FDC support since you must still supply any operating sprinklers. The process of recognizing that operations are going to occur near the zone interface and making connections to that second zone also keeps the pump operator keyed in to communications if water supply problems are suddenly reported, even when other nearby crews are not reporting any water supply issues. The necessary steps have been taken to employ corrective action if the contingency becomes necessary. As a reminder: When you begin to supply an adjacent zone, adjust your pump pressures to maintain the required minimums in each zone while not exceeding the maximums for any zone. Pressure and flow requirements. Once the hoses are dropped and the connections are made, you need to know how much pressure you are going to provide. This is one of those times when too much can be just as bad as not enough. Pumping an FDC takes some finesse and skill. A few pounds more or less won’t turn the table, but there is a definite need to apply theory and some math to ensure that you are not below system minimums and are not exceeding the maximums of the piping and components. Between those two extremes is the gray area where pump operators must aim to keep sprinklers operating and hose streams developing adequate flows and penetration. When dealing exclusively with sprinkler-protected properties, the margin between minimum and maximum can be bigger; performance is best gauged by observing smoke and fire conditions from the exterior. Observations from the interior will be very difficult, as water-cooled smoke is driven to the floor; the best indication will likely be from the exterior, since not only does the color of the smoke “cool” but also the intensity and pressure of it decreases from various building openings. Note: It is inherently dangerous to shut down sprinklers early so visibility can improve and crews can make an offensive attack; historically, this practice has led to casualties and sizeable property losses. Fire departments may have certain expectations about fires in sprinklered properties that can lead to hasty or erroneous decisions about shutting down the systems and making an interior attack. Officers and commanders may have an expectation that when sprinklers are operating in a building the fire should be out by the time the fire department responds. The reality, however, is very different, and that can lead to the mindset that something is wrong and the sprinklers are not controlling the fire. They, therefore, undertake an interior attack while shutting down the sprinklers. During large-scale testing of fire sprinkler systems, it was found that sprinkler systems can commonly require in excess of 30 minutes of constant operation to achieve true control over a fire, particularly in high-hazard and storage occupancies. Some of the best performance during testing was achieved by leaving the building relatively closed and providing continuous support to the systems for upward of 30 minutes before shutting down and naturally ventilating. This is contrary to fire department operational mentality, which says you get in there and put that fire out immediately. During one such test involving liquids, the sprinkler system had achieved apparent control and the test was effectively concluded. On ventilating the area to relieve smoke and steam, the sudden influx of fresh air reignited the fire, and it burned with intensity until being extinguished with manual hose streams. There’s nothing to be saved by prematurely shutting down the sprinklers only to have the fire race through the occupancy, forcing an exterior defensive operation that results in a total loss. Long before the fire occurs, there is a distinct and measurable benefit to performing preplan inspections of protected properties. Particular attention needs to be paid not only to the building layout but also to the protective systems provided. It is not enough to find the FDC and control valves in these buildings. Every effort must be expended to review building plans and design documents to understand how the systems are designed and the level of fire department support needed. In the absence of design plans, look at or near the sprinkler risers for some type of hydraulic design data plate. All sprinkler systems are designed to receive a minimum amount of water to the base of the riser while still performing as designed. To provide any supplemental benefit or support, the FDC must be supplied with at least that much water volume and pressure and, when there is an indication of a developing fire, you should increase your rate of delivery. When you increase the pressure in the sprinkler system, the operating heads do not increase their coverage per se, but rather the area they are covering remains largely the same while increasing the density or amount of water being applied in that area. Think about how quickly you can fill a drum with water through an open hose at 40 pounds, and then repeat the test at 100 pounds. The water isn’t really going any farther, but you are definitely getting more water into that drum in less time. That increased density allows the sprinklers to absorb more of the heat being produced by the fire and to cool and quench the fuel packages nearby to prevent their ignition, which effectively will starve off the fuel from the fire, leading to fire control or suppression. When the water supply to the building sprinkler is equipped with a fire pump, the FDC must be supported with a pressure above that which the fire pump is already producing. To avoid creating exceptionally high pressures, an FDC on a fire pump system is connected to the discharge side of the pump. If not, then the pressure supplied to the FDC is increased by passing through the pump and can quickly exceed the maximum pressure ratings of the system piping and components. The only way to know these variables, such as minimum water supply and pump discharge pressures, is to develop the information and a plan in advance under nonemergency conditions. Some jurisdictions have taken the proactive approach of requiring the inlet pressure of the FDC to be posted at the connection along with the other required signage (photo 23). This relieves the pump operator from calculating or locating critical system information in an emergency. The simple act of posting this information at the FDC ensures that proper support to the system is provided in an emergency. Incidentally, the posting of the inlet pressures at the FDC has been required for standpipe systems (NFPA 14) for more than 20 years. One of the best times to develop information about system design and required support from the FDC is during construction. When the systems are being installed, the plans and design documents are readily available at the building and in the permit files. In addition, the installing contractor can be easily located and questions about the system can be answered by the person responsible for installing and testing it. That information can then be posted on the signage, making emergency operations more reliable. Even a few years after a project is completed, memories may fade and documents may become difficult to locate, which will hinder preplan development. It is always best to seize the opportunity to learn while the work is still fresh in everyone’s mind. Although all that preplanning and signage sound good, we still must have an idea of what to pump in the absence of any other building-specific information. If the sprinkler installation is such that pressures greater than 175 psi are not required for proper operation, the connection does not require special marking or signage under the national standard. Therefore, all system components and piping are designed for at least 175 psi, which means the fire department can supply up to 175 psi into the connection without creating undue risk of system damage. Depending on the size of your supply hose and the distance from the pump to the FDC, you may need to adjust the pump discharge pressure; an end delivery of 175 psi to the FDC is the maximum you should consider delivering, and only under advancing fire conditions. If you are dealing with a single-story or low-rise building with light smoke or a contained fire, you should certainly throttle back your water delivery and increase it as necessary if fire conditions appear to deteriorate. Initial operations should introduce approximately 100 psi into the FDC inlet and then gradually increase up to 125 psi while continually gauging progress. The overwhelming majority of sprinkler installations in low- and mid-rise buildings do not have building fire pumps to boost water pressure; therefore, the sprinkler systems are already designed to work on the available city pressure, which is generally 65 psi to 95 psi. The supplemental nature of an FDC at 125 psi will substantially increase the density of water being delivered through the operating sprinklers; consider pressures from 125 psi to 175 psi only when you are faced with a large-area building or vertical occupancies with fire conditions that are not apparently being controlled by the sprinkler system. Take all precautions to avoid the sudden introduction of high-pump discharge pressures into the FDC. There is nothing to be gained by creating a sudden surge of water into the system, and there is a potential for damaging or creating a failure in the system piping. 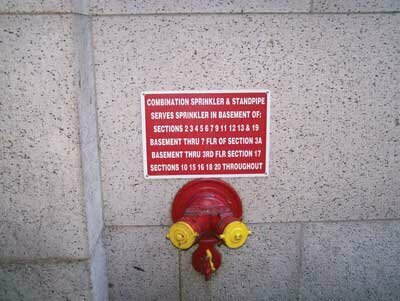 Once a building sprinkler system requires an FDC inlet pressure in excess of 175 psi, there are requirements for specific signage indicating the operating and maximum pressure that can be supplied into the systems. This will often be found with high-rise buildings above 15 floors in which one or more fire pumps may be used to overcome excessive elevation loss. Failure to provide the posted pressures in these instances can result in apparatus pumps just churning without water flowing into the system. When working with standpipe-equipped properties, things become slightly different and require a greater understanding of the support required. 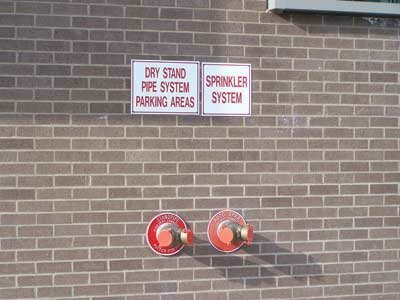 Although sprinkler systems require an adequate automatic water supply, a standpipe system can be installed without a water supply that provides the full demand for operating hose streams. Standpipe systems connected to a water supply capable of providing the required hose stream flows are considered “automatic” and may be wet or dry. Other standpipe systems that do not provide a water supply capable of supporting hose streams are considered “manual”; they also can be wet or dry. This information is of critical importance because manual systems are fully permissible by code because when you arrive at an incident, the urgency to provide full support for all anticipated hose streams becomes paramount. You cannot commit crews to interior hoselines off the standpipe until you have secured a reliable water supply and are pumping that volume into the FDC. Providing the required volume can be calculated by multiplying the number of hoselines by 250 gpm and ensuring you are feeding all available hose connections on the FDC with their own hoseline off the pumping apparatus. Developing the correct minimum pressure into the FDC requires more calculation by the pump operator based on the length of hose to the FDC, the vertical height to the fire floor, the length of attack hose off the standpipe, and the operating pressure of the particular nozzle. National standards once required a standpipe to deliver 65 psi at the topmost hose valve in a building. That 65 psi was based on the belief that the attack hoseline would be 100 feet of 2½-inch hose with a smooth bore 11⁄8-inch nozzle. The tragic One Meridian Plaza fire brought attention to the problems associated with using smaller hoselines with automatic type nozzles and incorrectly set pressure-regulating devices on the hose valves. The lessons learned at this fire led to changes in the national standards for standpipe systems, including a minimum of 100 psi delivery to the topmost hose valve in a standpiped building. That change, however, had no bearing on any existing system; today, there are some jurisdictions that still allow standpipe systems to be designed for 65 psi. The current building code in New Jersey even allows a standpipe system that does not meet any residual pressure requirement when installed in other than a high-rise building that has an NFPA 13 type sprinkler system. These design allowances under the building codes demand that immediate and complete support of the anticipated hose streams be provided by the responding fire apparatus before any interior attack is staged. If an attack hoseline is provided with only 20 psi or 30 psi under a building code allowance, it is absolutely useless, and the appearance of a functional standpipe system in such a building can lead to tragic results if a prompt and reliable water supply is not immediately developed. To calculate FDC inlet pressure on a standpipe system, you must first know the flow and pressure requirements for your agency’s standpipe hose pack, including the nozzle. If you are following the national standard including systems pre-1993, that would be 65 psi (100 feet of 2½-inch hose and 11⁄8-inch smooth bore nozzle). That becomes a fixed value for your agency, and you must calculate only the distance between your apparatus and the FDC and then the elevation and piping loss from the FDC to the highest operating floor. Although we may very well connect to the standpipe on the floor or two below the fire, we will still be operating on the fire floor, so we must account for that elevation loss. Furthermore, vertical operations may require that hoselines operate above the fire floor to control interior extension and autoexposure, all of which occur one or more floors above the fire floor. It is necessary for the pump operator to consider this highest operating floor level when estimating elevation loss in the standpipe system. Pressure loss because of elevation is calculated at 0.433 psi per foot (to easily remember and calculate, we round up to 5 psi/10 foot). Again, this is not an exact science; our goal is to provide a reasonably close water supply to the crews and to let them gate back small pressure differences. It is very difficult to estimate the actual friction loss through the piping and various fittings in the system. You have to use your experience and best guess as to the piping distance from the FDC into the riser where the crews are operating. In large city block buildings, the FDC can be several hundred feet horizontally away from the riser where crews are connecting. On the other hand, a smaller building may have its FDC on the opposite side of the wall from the riser, and there is hardly any horizontal piping to contend with. If your best guess is to pump 250 psi into a standpipe for a third-floor fire, there is nothing that the interior crews can do to gate back your gross overpressurization. In the early moments of the hoseline operation, it is reasonable to expect communication about adjusting pressure, but it is incumbent on the interior crews to give pump operators usable information. Hopefully, the operating hoseline is equipped with an inline pressure gauge so you can hear exactly the pressure they have while flowing from the valve and you can adjust your pump from there. A report of more pressure needed is of little value—is that another 5 psi or 50 psi that is needed? The report should be brief but provide useful information. The response to increase pressure 15 psi is not “I’m already giving you 145 psi.” If the crew wants another 15 psi, then that’s what it wants. It isn’t for pump operators to understand how the building piping is configured and where the extra friction loss is occurring. You are responsible for delivering adequate volume at all times while maintaining the minimum operating pressure for the highest operating hoseline; variations of 10 to 20 pounds above actual requirements are easily absorbed and gated back on the individual floors. All planning and construction inspections aside, there is the inevitable fire occurrence that must be professionally mitigated by the responding fire department. What you do and don’t do early in that scenario will bear heavily on the outcome for you, your agency, and the community. This is the moment when your training and preplanning will pay off. Here is some of what you need to remember. In the absence of a clear and viable rescue creating an exigent need for manual intervention on arrival, secure an adequate and reliable water supply to feed and support the FDC, whether it serves a sprinkler, a standpipe, or both. Light smoke or hazy conditions can quickly change the fireground picture, and an operating sprinkler system needs fire department support just as a hoseline operating on a fire. 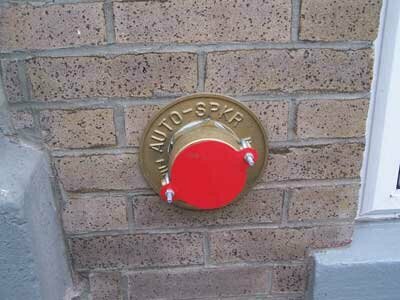 You must ascertain the operating status of a sprinkler/standpipe system before committing personnel into a fire area. This is more than just checking an alarm annunciator for a water flow signal. A crew must be assigned to the fire pump/valve control room to ensure system equipment is operating. This crew must have reliable communication with Operations and be able to assess impairments that could impact the systems or interior fire attack. Unless specific instruction/signage is provided for a specific system or protected property, never provide more than 175 psi to an FDC. Buildings that require FDC inlet pressures in excess of 175 psi are required by code to have signage indicating the required pressure to provide for proper system operation. Pressures in excess of those for which the system and its components were designed can cause damage or failures that will have detrimental impact on the fireground. When supplying a standpipe-equipped building, stand-alone or sprinkler combination, provide at least one hoseline to each FDC connection for each 250 gallons that interior crews will need. This includes all fire attack handlines and precautionary lines stretched into exposure areas or other floors. Plan on something going wrong and all those handlines being operated simultaneously. If the FDC has four hoseline connections, stretch and connect to all four on arrival. It’s only hose. You can pick it up later. Particularly when operating in standpipe-equipped properties, you must consider protecting the interior crews with redundant supplies and hoselines. Bear in mind the potential fire area and involvement in larger unsprinklered properties that have only standpipe systems; successful fire attack will require multiple handlines operating simultaneously and for long durations. The weakest link in that chain can be the single engine and its hydrant supporting the FDC. Strongly consider stretching additional hoselines to the FDC and leaving them dry on the ground for rapid connection should a hose failure occur. Also consider committing another engine and water source to FDC duties during extended operations. Mechanical issues could arise and render the initial engine unable to pump the FDC, which will place the interior crews in harm’s way without warning. Position this redundant FDC engine early in the operation; doing so later may be impossible and may necessitate exceedingly long hose stretches. Although perhaps not the most glamorous fireground assignment, the position of pump operator during an FDC support operation is critical. Personnel must fight any temptation to be distracted by other activity or to wander from the pump panel. The popularity of automatic governor equipment regulating a pump may appear to reduce the need for pump operator diligence, but this could be a fatal mistake. The pump operator must remain positioned at the pump and be keenly aware of all aspects of the operation, from water supply to pump operation to end handline performance. The only chance for early warning of loss of water supply or pump failure will come from this position. The interior crew’s lives depend on a vigilant operator who is at the pump panel and not wandering about the fireground or shuttling air bottles. DAVID T. PHELAN has served in the fire service for 18 years as a member of the Bergenfield (NJ) Fire Department. He is a certified fire officer I and licensed fire protection/construction official who has worked extensively in fire protection and construction enforcement for various public agencies. As an instructor, he has developed several programs relating to fire protection systems and teaches in the fire protection licensing programs at local colleges.